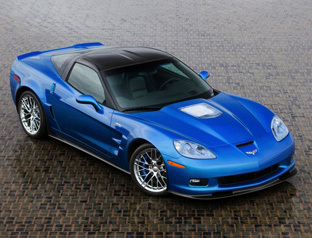 The 2009 Chevrolet Corvette ZR1 revives the ZR1 badge which was last seen on the C4 Corvette generation of 1995. Over ten year later GM have decided to introduce a new ZR1, a car which promises to be the fastest production Corvette ever created. 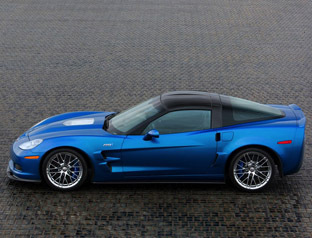 The aluminium and magnesium frame of the Corvette Z06 provides the base for the 2009 ZR1, but the body work which covers it is beefed up in many areas. Starting at the front, a race-inspired Splitter formed from carbon fiber makes an appearance, the hood features a Lexan window cut into the center to show off the LS9 V8 engine, and just behind the front wheels redesigned air vents extract hot air from the engine bay. To save weight the entire front clip is made from carbon fibre. Moving down the car, the ZR1's roof is also made from carbon fibre which has been left unpainted to show off the materials attractive weave pattern. At the rear of the 2009 Corvette ZR1 two small flip-up spoilers have been integrated into the rear panel to help improve downforce over the rear end. 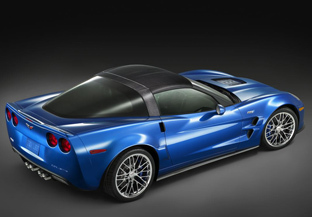 Powering the 2009 Chevrolet Corvette ZR1 is a 6.2 litre LS9 V8 engine which is force-fed air by an Eaton supercharger. The power is run through a Tremec 6060 six-speed manual gearbox to the 20" rear wheels. 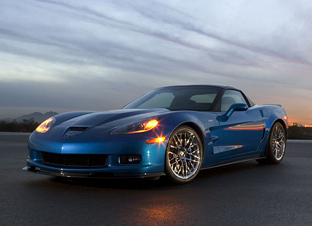 To help bring the 2009 ZR1 to a halt Chevrolet have equipped the car with 15.5 inch carbon composite front brake discs from Brembo, the rear discs are also massive, measuring 15 inches across. The calipers are 6 piston and 4 piston units front and rear respectively, both are painted in a bright electric blue. The ZR1's suspension is handled by the same magneto-rheological dampers as the Ferrari 599. The dampers are filled with a fluid which is mixed with iron particles, and the viscosity can be changed instantly by varying the electric current passing through it, therefore adjusting the damping rate. 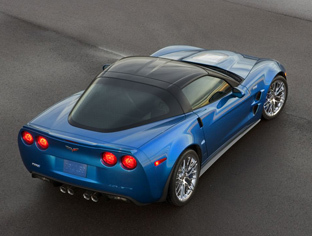 The ZR1 adjusts the dampers every 0.002 seconds to react to the changing road conditions.